« Star Ratings are Here! 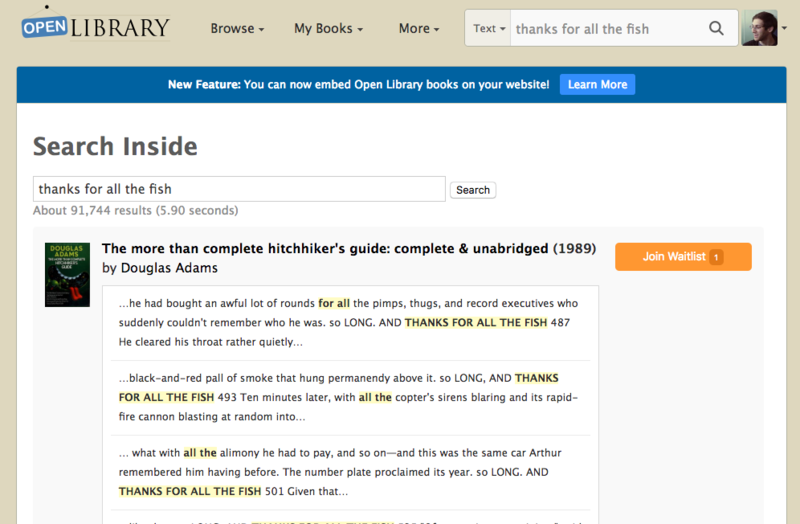 Open Library now lets you search inside the text contents of over 4M books! Many book websites, like Amazon and Goodreads, give you the ability to search for books by title and author, but they don’t make it easy to find books based on their contents. This type of searching is called “Full-Text Search”. I’ve been surprised to learn how many people didn’t know that Archive.org has had full-text search for several years — and its really powerful! In 2016, Giovanni Damiola (@giovannidamiola) led a major overhaul of Internet Archive’s full-text search system and unlocked the ability for users to perform full-text searches across almost 40M unique text documents — from patents, to yearbooks, to open-access research papers. When you search across 40M documents, it can be a challenge to find the one you’re looking for. One feature which Open Library has been missing is a way to limit Internet Archive’s full-text search to only include results from books on Open Library. So for the last two years, Open Library has patiently waited to take full advantage of full-text search for its users. 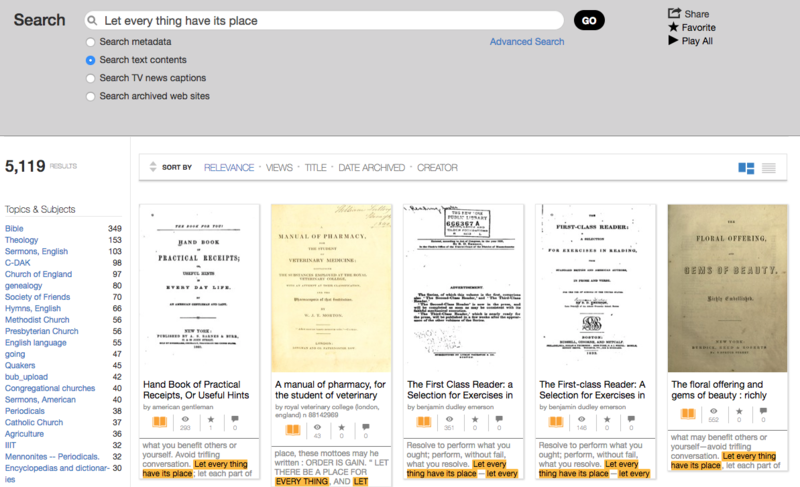 Earlier this week, Gio released an improvement to our full-text search engine which lets us get around this historical limitation — and so we jumped on this opportunity to improve our search on openlibrary.org! With the help of Razzi Abuissa, Open Library volunteer, and Mek, Open Library’s project lead, you can now search inside more than 4M Open Library books. Thanks for all the fish! …Wait, what book was that from again? This entry was posted in Search. Bookmark the permalink. Both comments and trackbacks are currently closed. Great! Thanks a lot for making this happen. Still enjoying the fish after all these years. One of the best books ever. Compare to”The Sirens of Titan”. Interesting!!! Beautiful organisation of the web. Keep improving and creating these impressive user friendly atmosphere. 2018 A Year of Victories! Theme customized from Thematic Theme Framework.